This time I'm not the planner , I just joined with two of my friends who are very interested to visit this place again. cover the places Sakshi Ganapati, Hatakeswaram , Lalitha peetam, phaala daara - pancha daara , sikaram and Chenchu Lakshmi Museum and visit to main temple of Sri Brahmarambika Mallikarjuna Swamy. And next to cover Rope way journey to paataala ganga, Trip to Damn and return journey to Karnool by bus and visit Alampur Jogulamba on the way before 10:30 to catch Bangalore express train in Karnool. It was well executed with out any interrupts. We reached majestic by 6 thinking that bus will leave sharply at 6:30 PM sharply. But it started at 7 PM and with many stops it reached sreesailam at 9:30 AM. Immediately with the help of a broker we got into one Lodge which was called as Telikala satram. Though we paid unnecessarily to broker we got really brand new AC room and it was a pleasure stay in between the nallamalai hills enjoying the damn view from the hotel room. Good thing is that they provided food for free. After quick fresh-up we started for local sight seeing to cover Sakshi Ganapati, Hatakeswaram , Lalitha peetam, phaala daara - pancha daara and sikaram by auto paying 50 INR per head. All the places are filled by Siva swamys and they were coming from different places by walk to here. As the road was single lane it was critical for drivers to drive in between. As that was shiva raatri season Temple committee started "Brahmotsavaalu" and full place was crowded with many groups performing different arts in front of Lord shiva. By 1 PM we finished visiting these places and lunch, next plan is to reach NallaMala Ishta kameswari temple by commander jeeps. We were just three people and we have to wait for the jeep to fill minimum 10 people. They were charing around 250 per head and finally around at 2:45 pm we were able to start to that place and the whole road is full of rocks and the road was a difficult for any body to drive, I can say it's a good adventurous journey. I thoroughly enjoyed the ride and the scenic place near the temple. The ishta kameswari Deity was so beautiful and the temple was very very small. Any body has to bow-down their head and enter in the temple. Finally we were able to return to lodge by 6:45 pm. And after fresh-up we visited the main temple and then returned to room and took rest. The next day early morning we got fresh-up and went to main temple for darshan of Sreesaila Jyotirling and visited "Vrudda mallana" and other small temples inside the premises.Then after breakfast we went to patalaganga by rope-way and visited damn by boat. From there AP tourism is providing packaged tours to Akkamahadevi caves which are quite famous in this place but due to lack of time we couldn't go there. Finally we returned home and packed-up luggage to catch the Karnool bus. Luckily with uma maheswara swamy blessings we three got seats in the bus. We reached karnool town around at 5 PM , immediately from bus stop we hired one auto to go to Jogulamba temple in alampur for 400 INR. We reached the temple premises very quickly in less than 40 mins due to the village routes chosen by driver. 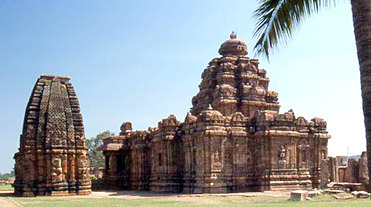 Jogulamba temple in alampur is one of the powerful temple among the ashtadasa shakti peetas. There were no bounds to my joy when I see the Tungabadra river in the the evening just beside the temple. It's really worthy trip at the end. 3 comments to "Sreesailam,Ishta kameswari,Alampur Jogulamba,Paataala Ganga, Akkamahadevi Caves"
Babu the blogs are tremendous, you believe I was browsing the site from past 2 Hours continuously & it is still more to go. I am fond of visiting holy places and I have visited many temples in Uttranchal and Himachal. Nice mandirs and you really feel calm and cool here. Great website and lots of beautiful pictures. Thanks for this nice blog. Nice information about the Jouglamba Temple. Do you know this Temple was taken over by Archaelogical Survey of India in mid 1970's.